We've driven the Nissan Juke R in Dubai, so it's with authority that we can say the 545-horsepower GT-R-powered crossover is as wild as it looks. We can also say with authority that we're not surprised Nissan found enough people willing to fork over the serious cash necessary to make the company produce this mental project car. But where would they ever find such people? Why, Dubai, of course. When we exclusively broke the story that Nissan Europe was taking a Juke and a Nissan GT-R and combining them like weirdo Gods in Greek mythology we were simultaneously perplexed and intrigued. It looks like a toad. It has the power of Godzilla. It is unstoppable — except for one tragic flaw: price. Who would pay for such an unnecessary car? Thank God for Dubai. According to Nissan, people on the streets were trying to buy it on the spot. 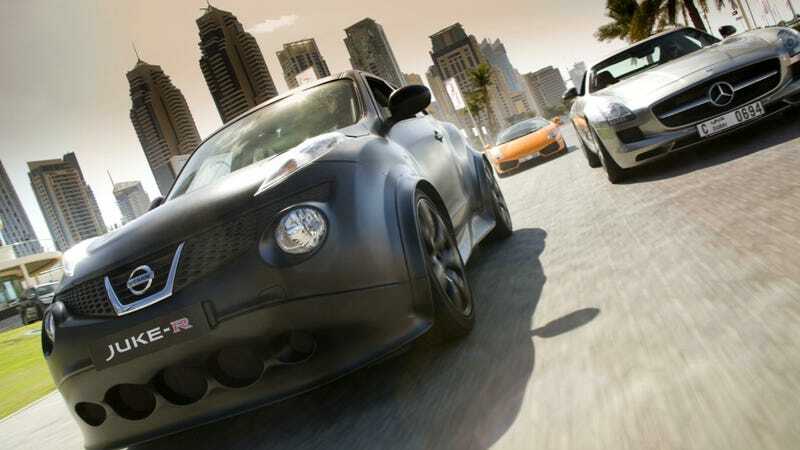 They were able to put together three serious offers for a "production version" of the Juke R and seem open to building the limited edition cars for the right people. The specifics of that price we don't know, just assume "a crap ton" if you're interested. Oh, if you are interested you can email Juke-R@Nissan.co.uk and they'll happily build one for you. Please CC us on that email if you're serious and if you buy one we'll place you among the Jalopnik deities. If you're on the fence, watch this dialogue free "Desert Nemesis" short film from Nissan featuring GT Academy star Lucas Ordoñez. Does it seem to anyone else like he's going to get kidnapped halfway through this video?